Birla Institute of Technology and Science Aptitude Test (BITSAT) is conducted by Birla Institute of Technology and Science (BITS) to offer admissions to interested candidates to its Integrated First-degree programmes including BE, BPharma and MSc programmes. 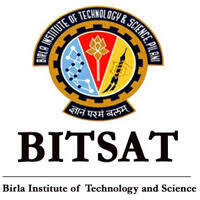 BITSAT exam is a computer-based test (CBT) which aspirants need to clear to secure admission at BITS campuses located at Pilani, Goa, and Hyderabad. The exam is a stepping stone through which candidates can secure admission in BE honors integrated first degree programmes offered at BITS campuses in disciplines like Civil Engineering, Computer Science Engineering, Electrical and Economics, Mechanical Engineering and Chemical Engineering. Apart from this, candidates also give this exam for admission into BPharma honors, MSc honors as well as MSc Tech degree programmes at the institute. BE Chemical, Civil, Computer Science, Electrical and Electronics, Electronics & Instrumentation, Mechanical, Manufacturing. MSc: Biological Sciences, Chemistry, Economics, Mathematics, Physics. BITSAT is a three-hour long exam where the question paper is divided into four sections containing multiple choice questions from subjects like Physics, Chemistry, English Proficiency, Logical Reasoning as well as Mathematics/Biology (For B.Pharma Candidates).